You have the hat, the heels, the dress. All you need now is the flawless complexion. Why the microderm infusion facial at Massage Envy is on everyone’s to-do list. It’s the closest thing to instant photoshopping for your face: Microdermabrasion exfoliates, extracts and polishes the skin with a whirring, diamond-head device that sloughs off dead cells, deep cleans, softens fine lines and leaves skin looking generally flawless. Its reputation as a no downtime, do-it-all treatment has made it popular with celebrities and the rest of the world before red carpet events and photo ops. Now, a more refined version called Microderm Infusion, offered locally at Massage Envy, adds extra benefits that increase hydration and overall glow—creating an even more radiant, youthful complexion. This latest version of the high-tech facial adds precision-timed hydration to the exfoliation and extraction. 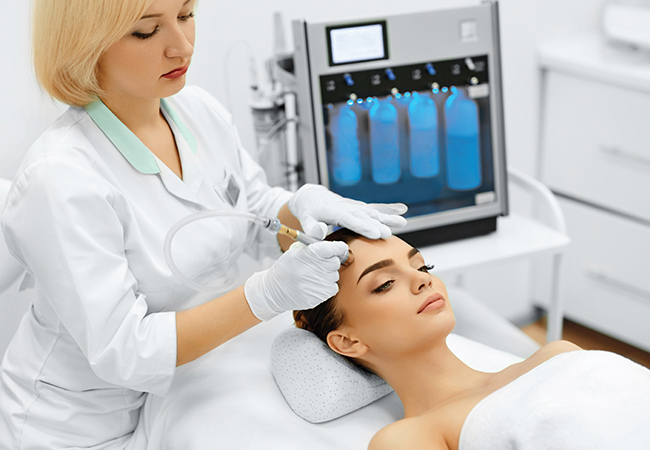 “As the patented diamond treatment head is drawn across your skin, it exfoliates your face, vacuums away residual skin cells and instantly applies a customized infusion serum,” explains Vycki Goldenberg, a local Massage Envy owner/franchissee. “It targets specific skin issues like breakouts while increasing hydration and overall radiance.” The fact that it delivers so many benefits with no downtime makes it a perfect go-to treatment for Derby, or any event where your complexion could use a quick but dramatic boost. (One caveat: Try to book at least a week before you head to Churchill, because it does make your skin more sensitive to the sun.) “It’s been a hit for spring because it does so much so quickly,” says Goldenberg. And who doesn’t want glowing, smooth skin under their Derby hat? Massage Envy has locations in St Matthews 502-895-2007, Springhurst 502-425-0000, Middletown 502-253-2980 and Clarksville 812-725-1387. Go to massageenvy.com for more information and appointments.